Keung Mak has dedicated his life to dim sum. For more than two decades, the chef has traveled through the kitchens of traditional Chinese restaurants in his native Hong Kong that specialize in “little pieces of the heart,” one of many English translations for the signature meal of small plates and hot tea. Hong Kong’s 7.5 million inhabitants continually pack more than 1,300 restaurants serving steaming baskets of shrimp dumplings (har gow) and barbecue pork buns (char siu bao). “The dishes haven’t changed in a century,” says Adele Wong, author of the book Hong Kong Food & Culture. Now some customers are as bored with eating the dim sum classics as chefs like Keung are with preparing them. In 2016 he broke with centuries of tradition and began pushing the meal’s boundaries at Social Place in Tsim Sha Tsui, a dense hub of high-end restaurants, shops, and hotels on the Chinese side of Hong Kong. Social Place, which has nine locations across Hong Kong, China, and Taiwan, has revamped dim sum for a new generation of diner: the millennials who pick where to eat based on Instagram feeds, and who approach each meal like a photoshoot. Keung’s creations first satisfy the eyes, then the stomach. One of these is a dumpling the shape and color of a mushroom, filled with julienned king oyster fungi, ginger, and truffle. The pillowy white bao, or bun, is Keung’s muse. He’s transformed it into a pig’s face with a snout, eyes, and little pink ears, filled with purple sweet potato instead of roast pork. (For those who want traditional pork, called char siu, Keung uses it to fill a turtle-shaped pastry.) Another unconventional signature dish is the jam-filled, sugar-crusted red “Bayberry” dumpling, with a mint sprig for a stem. Keung’s custard bao replaces the gelatinous egg filling with a thick liquid that oozes out like lava-the dim sum equivalent of molten chocolate cake. The bun is black from the charcoal baked into the batter-a popular, if medically unproven, health craze-and a bit spongier. Most dishes at Social Place are cooked without oil or fats, a nod to the restaurant’s younger, more health-conscious consumer. 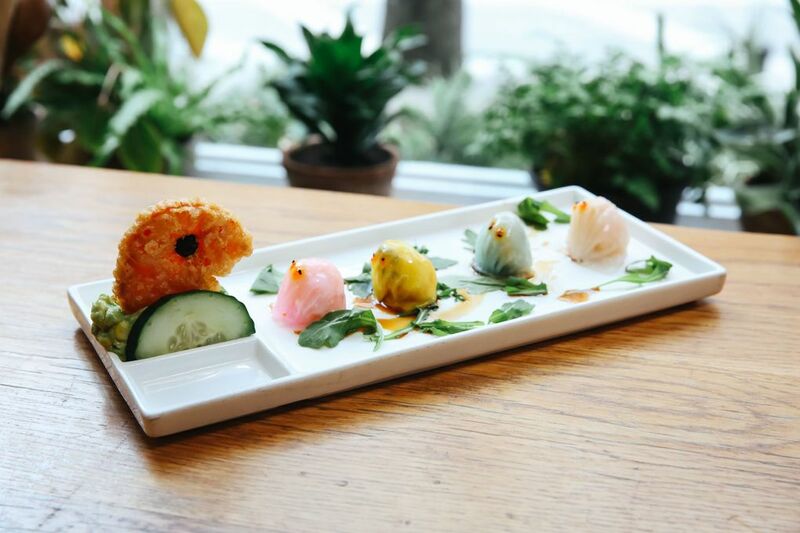 Instagrammable dim sum is spreading quickly around the world. Enthusiasts in the U.S. can find it at places such as RedFarm in New York and Chili House in San Francisco. But Hong Kong is the epicenter of the craze. The chefs at Social Place, who dine out at other restaurants to gather fresh inspiration, aim to introduce three or four new dishes every month. That’s the only way to retain their fickle customers. Keung’s latest experiment is not a visual dish that will delight kids who want to make a dumpling vomit. Instead, it’s a riff on a ball of sticky rice stuffed with chicken, and a barbecue pork pastry he has augmented with katsuobushi (dried, fermented tuna). It’s a dish that pushes the boundaries of the traditional form, rather than breaks them.